You need to trek to the east end (my hood) to find Madre; technically it’s in Nouveau Rosemont but since no one knows where that is let’s call it the east end (i.e. east of the plateau). It’s in an area that is gentrifying before your eyes and you can easily find nice restos, quaint shops and random old shoe stores alongside some run down shops. Madre is a small place with limited seating capacity (I would say around 30 seats). The kitchen has an open concept to it with glass doors and walls so you can see the cooks preparing and plating your meal with the care and attention to detail that is expected of a high-end restaurant. Madre combines various South American influences and presents them in what can best be described as a masterpiece on your place. 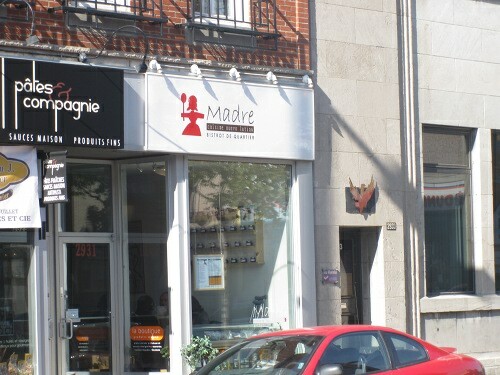 Madre is the product of chef Mario Navarrete Jr. who has made a name for himself working in such places as: Alma de Cuba, Café Boulud, Daniel, and owns Razza, a fancy and tasty restaurant on Laurier street. The menu is limited to 8 main items priced form $11.75 to $16.75 as well as 2 side dishes fruit salad sorbet ($7.00) and soup of the day with poached egg and bacon ($5.75). You will not find most typical breakfast dishes such as omelettes and waffles, nor would one expect to considering this is a nouveau brunch place. Although, what is impressive is that these dishes, while being true to their Latin roots, manage to keep a breakfasty theme all the way through. You will find French toast, eggs Benedict, and the non typical breakfast dishes will have eggs in them or smoked salmon; even the soup has eggs and bacon in it which is a great way of combining breakfast food ideas with new age food items. Enough talk about the food philosophy, let’s lift our forks and fill our stomachs! 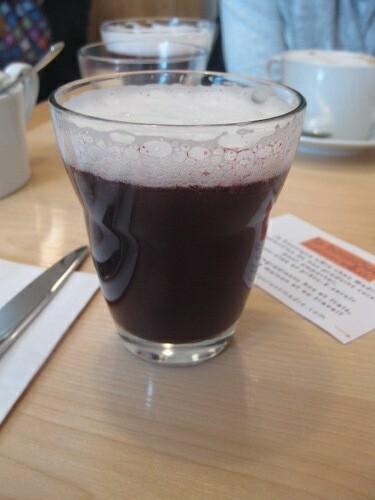 We started off with coffee (with free refills) and a fresh purple corn lemonade ($3.75). Originally, I was worried that lemonade would not make for an appropriate morning drink but people drink orange juice and that is citrus as well. When we tried it we were very impressed the taste was refreshing and unlike any lemonade I had before. The presentation scored points as it came with it airy foam that had some taste to it. As for other beverages, the regular coffee was included in my order. The taste was normal, nothing special there, but it did have free refills, which I was worried it would not since fancy places tend to nail you on coffee. My friend had the latte and she was very impressed with it. There were no free refills on it but I have never seen any place that offers free refills on fancier/non regular coffee anyway. Each of the plates came with a corn bread-like side and butter. The breads were nice and warm and you could tear them apart and enjoy that nice comfortable and warm taste you get from Latin breads. This is quite the treat in the morning since something light and warm really helps to start off the day. The menu has some items like French toast with caramel sauce and yogourt ($11.75), poached eggs and chorizo air ($13.50); boiled eggs and smoked salmon potato salad ($14.25). There are some of the menu items that are a little more on the lunch side of the spectrum but note how they have a breakfast item to help bridge the gap items like hanger steak with sunny side up eggs and potatoes ($16.75); pork cakes with sunny side up eggs ($15.75); green peas soup poached egg bacon ($4.75). 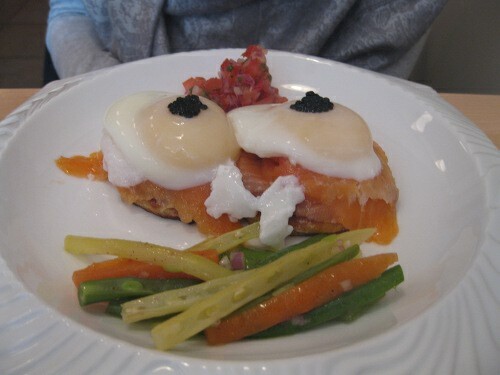 My friend ordered the poached egg and smoked salmon ($15.75) which came served on a potato pancake and topped with caviar as well as a side of vegetables. The vegetables were odd to see since you don’t expect that for brunch but they did a good job to complement the meal and the potato pancake base was pure genius! It provided the right support for the eggs and the smoked salmon paired perfectly with the caviar to give the dish a taste as impressive as it looked. 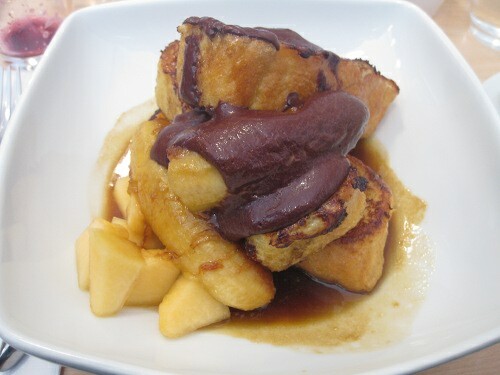 I ended up ordering the sweet potato French toast ($13.75) which came with caramelized bananas and chocolate. This dish impressed me on many levels: initially I was worried that the portion size would not be to my liking since fancy places usually mean nice looking food but not much of it. But as I have experienced many times before, those preconceived notions often tend to be wrong. The portion size was quite generous and I left the table full and happy. The taste of this dish is unlike any I have ever experienced and is an example of the vision and skill of the staff at Madre. The bananas were sweet yet not overpowering while the chocolate was a nice bitter chocolate (you know that traditional real chocolate taste that is also rooted in South American cuisine); they paired so wonderfully together that I was in heaven. The sweet potato French toast did a great job of bringing everything together. You could see the precision of flavours and each square inch of the meal had its distinctive sharp taste in which the flavours maintained their identity even if mixed in by myself. Although the price is around $4 – $5 more than the average brunch place, you get quality ingredients with some freebies thrown in and a taste and skill on your plate that would run you twice the price normally. Honestly, for a fancy/nouveau brunch place the price is not that high and I have paid close to the same amount at some other places that did not get anywhere near the quality and experience I got here. The service was good and our waiter explained in detail the background of the restaurant and cooking philosophy. He also did this with pride and managed to keep us interested. He was also helpful with tips on what some of the favourite dishes were. He seemed a little spaced out at first but that did not detract from the service we got. Although the menu is not that large, there are a good amount of vegetarian options and if you are a pesco-vegetarian (that’s were you don’t touch meat but fish is ok) then your options increase. If you are vegan, you are out of luck since there don’t seem to be any vegan friendly dishes. Although the menu is not exhaustive and it is not your run of the mill breakfast place, Madre more than makes up for this by shaking things up and breaking the mold. If you are a classic breakfast person (eggs and bacon) then this is not the place for you but if you are interested in seeing new forms of breakfast/brunch while still having some culinary roots in those time honoured morning ingredients (eggs, smoked salmon, French toast) then I strongly suggest you try out Madre. 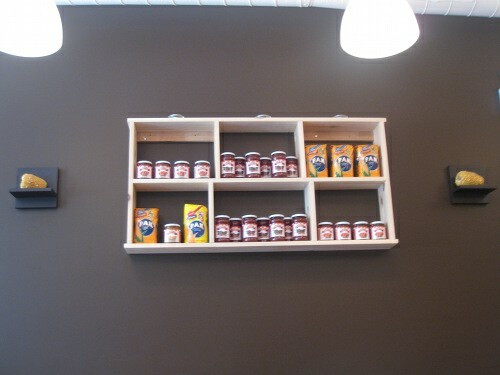 The price is not that intimidating compared to other places that are deemed Nouveau Brunch and you do get lots of free stuff such as coffee, homemade breads, and jams which is not characteristic of fancy brunch places. The taste is incredibly refined and the care and presentation taken in each dish is second to none. Considering the price and what you get I strongly suggest you check this place out. As of now, it is my favourite of the nouveau brunch places. Congratulations on a job well done. This was a great place. We had their pork stuffed in a wonderful pastry; the pan dore made with a yam bread, a type of frittatta with an amazing spicy sauce. The coffee was good. The Espresso was great. 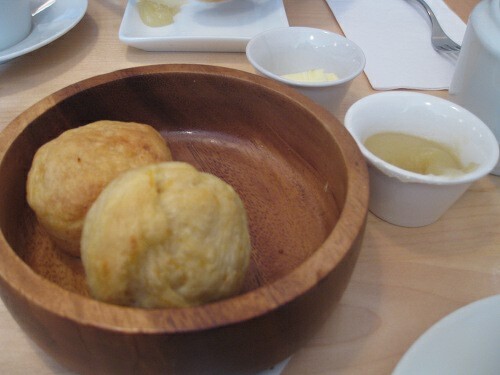 The apple butter was amazing for the yam bread that was provided before the meal. There was an amazing corn lemonade that was delicious. One complaint; our smoked salmon had to be sent back because the eggs were underooked (my wife likes them hard); i think they served us the same salmon, because it came out cooked instead of firm like cold smoked salmon should be, and the potato pancakes were not so good, and the caviar was so-so-perhaps due to the extra time waiting to recook the egg. They should have made the dish over again, and it was not good that they didn’t seem to. But to make matters worse, they said “you should have told us earlier” and made no adjustments on the price, though we only ate 1/2. This was low class, and certainly came directly from a conversation with the chef owner by the waiter, since there was almost no one else in the restaurant. This was a disapointment. But the overall experience was quite good, and I recommend this to others, though the chef should be a little contrite about this gaff. Thanks for the recommendation.